Several kids, including an 11-year-old, drove an Indiana school bus at the behest of its adult driver—who now faces charges. Ash-har Quraishi reports. Several kids, including an 11-year-old, drove an Indiana school bus at the behest of its adult driver, who now faces charges, authorities said. The bus driver, Joandrea McAtee, 27, was arrested Friday after the Porter Township Schools Administration and Porter County sheriff's deputies investigated a parent's complaint, according to county sheriff's office. McAtee was charged with neglect of a dependent. 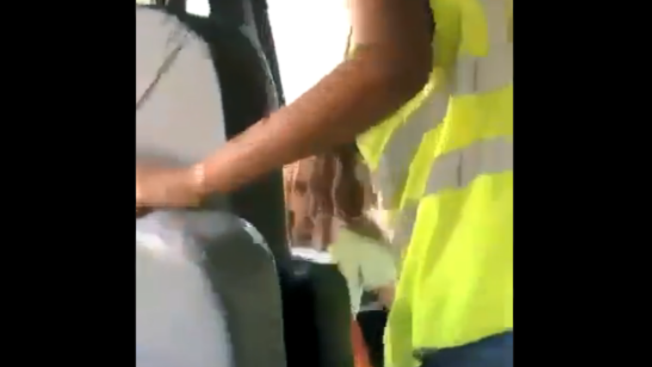 Videos posted on social media show children allegedly driving the bus, and authorities said other students witnessed it. According to the Northwest Indiana Times, a parent contacted a Boone Grove High School resource officer on Thursday about a bus driver letting students take turns driving her bus. McAtee allowed three students, ages 11, 13 and 17, to drive her bus as she was dropping students off from school, deputies said. The students drove a short distance in a rural part of Valparaiso. McAtee was fired, according to bus company First Student, which said in a statement, "We are incredibly disappointed by the actions of our former driver." She was arrested by sheriff’s deputies when she went to pick up her final pay check on Friday, according to the Times. "The students and parents that immediately came forward with this information should be commended for doing exactly what we teach, which is 'See something, say something,'" Sheriff David Reynolds said. "An investigation was immediately started and no one was injured or harmed. The Sheriff’s Office and the Porter Township School Corp. takes safety and security of every student seriously and every parent must understand that this case will be investigated thoroughly." It was unclear if McAtee was still in custody or if she had a lawyer. A woman at an address listed as McAtee's offered no comment on Monday.